We are looking for fixers and volunteers of all kinds! 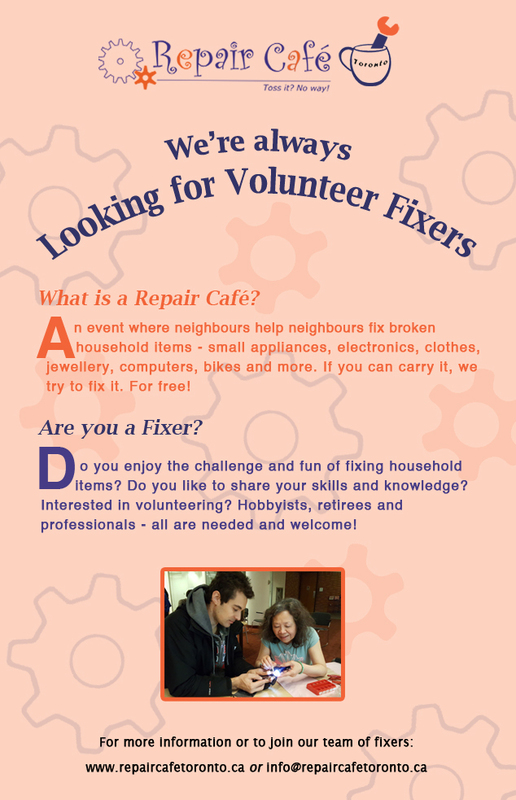 If you enjoy repairing things and helping others learn how, we invite you to join us as a volunteer fixer at the Repair Café. Your repair skills in fixing household items such as computers, electronics, small appliances, small furniture, clothes, jewellery, books, bikes and more, are all welcome. We are also looking for volunteers to provide general support at our events or behind the scene. Tasks to help with include event set-up, refreshments, visitor registration and guides, graphic design, communication and marketing, photography/video, etc. For more information about volunteer positions please see our volunteer descriptions pamphlet. First time volunteers can also read our “411” for new volunteers. Want to learn alongside an experienced Fixer? Occasionally we get requests for paid fix-it jobs. Click if you’d like to be informed. Repair Café is a free event for everyone. Not only will you support your community by sharing your repair know-how, but you’ll also meet other fix-it enthusiasts. Enjoy refreshments and chat with people from the community hosting the Repair Café. Who knows, in the process you might even make some new friends!